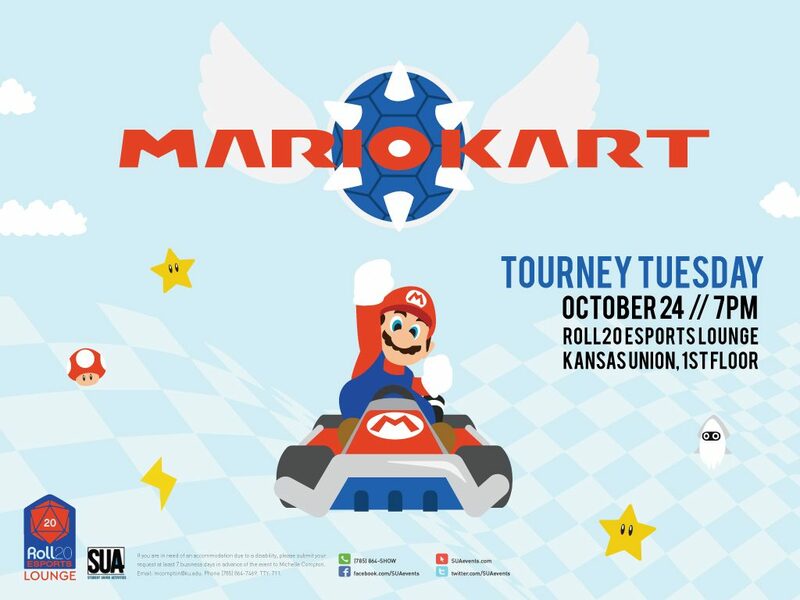 In honor of this week’s Tourney Tuesday game, Mario Kart, we’re looking into the course that gives players the most difficulties, and frustrations. Whether it has Thwomps or Chain Chomps, the infamous Rainbow Road is a thrilling and, always evolving, challenge in itself. In order to be one of the 8 prize winners Tuesday night, you’re going to need to know Rainbow Road. From 1992 to now, the final course that has been “driving” people crazy is good ole’ Rainbow Road, and although it may have a consistent spot on the map, its design is a little less set in stone. 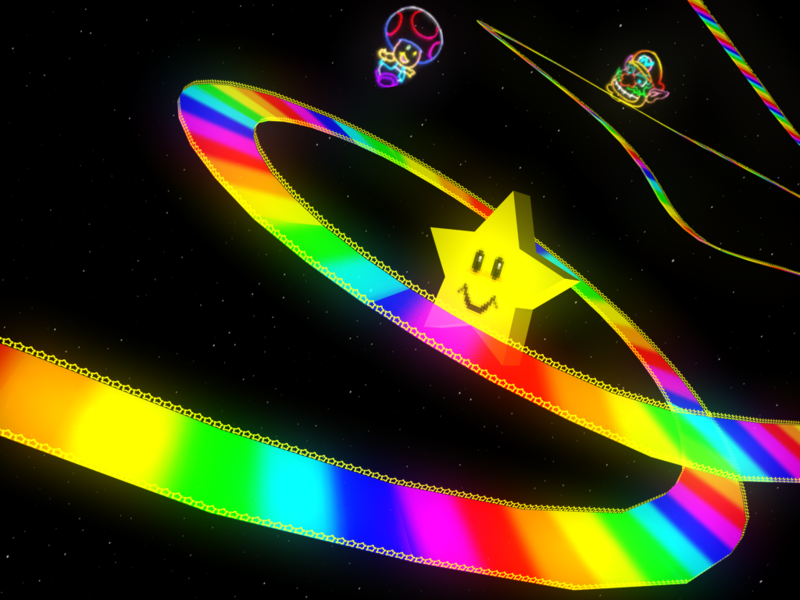 Rainbow Road started out as a flat, straight-edged, road made of multi-colored blocks. Over time, this track has seen its fair share of changes. Sometimes the road is transparent, or it changes color as players race along it. Other changes in the course include corkscrews, loop-de-loops, and even wavy roads. In Mario Kart 7 and 8, racers experience Rainbow Road without its signature rainbow roads, where the player drives on Saturn’s rings and the surface of the moon. One of the most difficult aspects of this course is the fact that you can fall off the course at any moment due to it’s lack of railing, the exclusion being the Nintendo 64 course which has railing on the entire road. This means that racers must be strategic with their boosting and hopping when going around curves or corners. While maintaining just the right speed, racers must also watch out for barriers on the road itself. These barriers include traditional enemies like Chain Chomps and other player defenses like shells, bananas, and lightning. As I mentioned before, Rainbow Road is it’s own challenge, so enemies are only found every so often. Thwomps generally stay the same on different Rainbow Roads, but the same in not true for Chain Chomps. In the Nintendo 64 Rainbow Road, the chomps are found zigzagging through the transparent road. In Mario Kart 8, however, Chain Chomps must be dodge as they bounce on certain sections of the course. The good thing about having no railing is that shells cannot bounce back at you, instead they fly off the course. So the only thing you have to worry about are the red shells (homing shells) and whether or not the other players have good aim. Esports Lounge Tuesday night at 7pm! Snacks will be provided! Please bring your own controller (or more) if you have some. We’ll be playing on Wii, Nintendo 64 and GameCube! ← Midwest Fall Fest this Saturday!